The Residential Energy Consumption Survey produced by the Energy Information Agency in the U.S. Department of Energy collects information on various housing characteristics, including the age of the structures. For example, home occupants are asked if their homes are “well,” “adequately” or “poorly” insulated (homes with no insulation at all are a separate, but rarely checked category). Tabulating the results shows that, overall, 38.6 percent of households in single-family detached homes judge their homes to be well insulated. However, as you might expect, the results vary depending on how old the homes are. 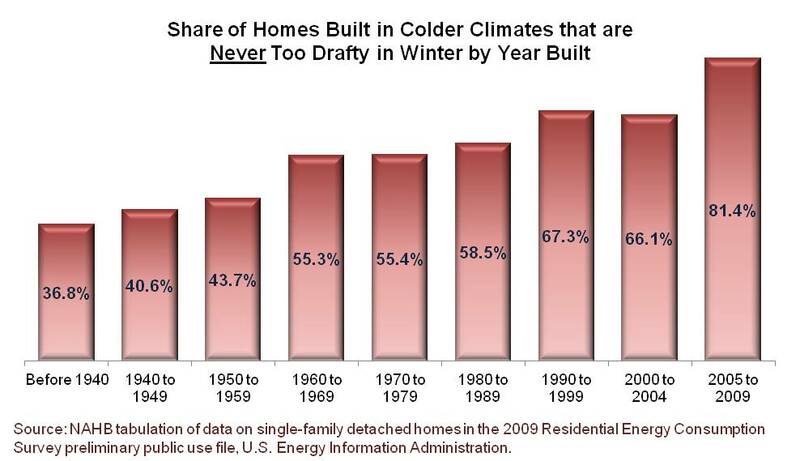 Among occupants of single-family detached homes built before 1960, the well-insulated share is under 30 percent. After that, the share increases regularly as the homes get newer until it reaches 67 percent for homes built after 2004. The RECS also asks occupants if their homes are too drafty during the winter. Here, the choices are “never,” “some of the time,” “most of the time” and “all of the time.” Because perception of winter draftiness is likely to depend on the climate, the chart below is based only on single-family detached homes built in the colder climates—defined here as areas with at least 5,500 heating degree days heating degree days, which captures the two coldest of the five climate zones specified in the RECS data. Overall, 52.0 percent of occupants report that single-family detached homes built in these climates are never too drafty. Once again, there is a substantial difference between newer and older homes. The “never drafty” share is roughly 37 percent for homes built before 1940, climbs to round 55 percent in the 1960s where it remains relatively stable until the 1990s. The “never drafty” share is about two-thirds for homes built from 1990 to 2004, and then jumps to 81.4 percent for homes built more recently than that.